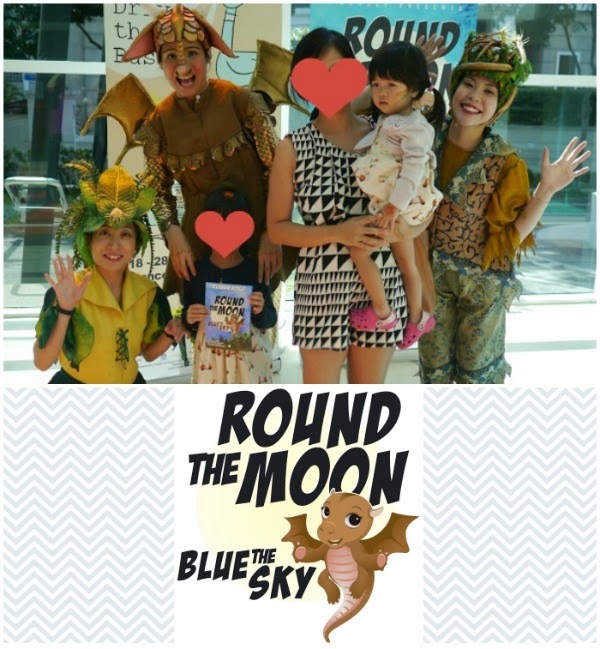 We were invited to watch I-Theatre's latest production "Round the Moon, Blue the Sun" this week. Bun has never been for a theatre show before, and upon seeing that the production is suitable for children from aged 2, I readily said Yes, and looked forward to taking both Bubbles and Bun along. Why is the moon round? Why are there so many colours and shapes in the world? 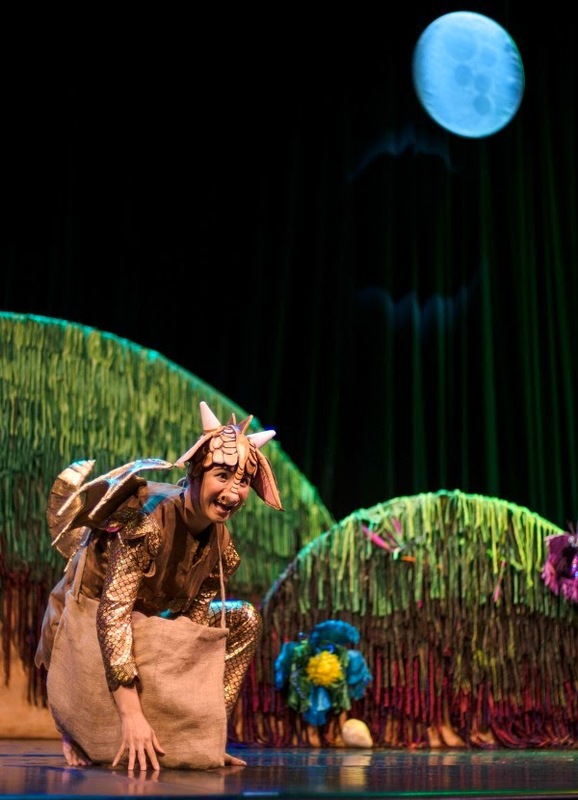 Come, journey with Smallest Dragon as she goes in search of answers in a magical, whimsical and colourful world. I-Theatre brings you a special collaborative project featuring the best from Singapore, Hong Kong and Japan. 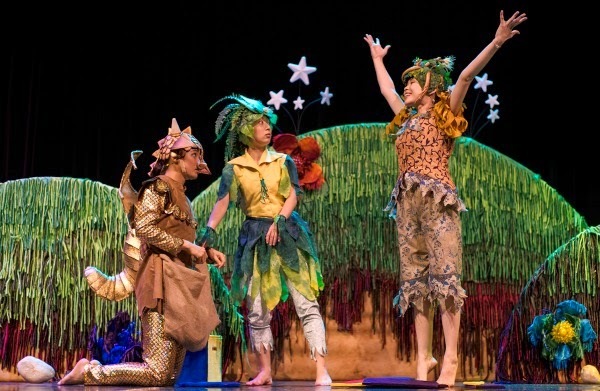 Round the Moon, Blue the Sky is a fast-paced, lively and physical production about Smallest Dragon. She is always asking questions, poking her nose into things and curious about the world. What are her favourite words? 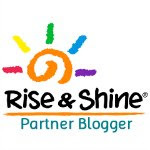 WHY and HOW and WHAT! One night she sees the moon, and wonders why it is the shape that it is. Fascinated, she sets off to find other round things – and quickly realises that there are many other important shapes too. As she explores, she also discovers the wonder of colours! Combining a unique blend of physical theatre, riveting puppetry, black light magic and lots of audience interaction, this highly engaging and educational performance is specially tailored for children from 2 to 8 years old; although older children and grownups will find much to amuse, enthrall and engage too! This 1-hour production is shown in the cozy Alliance Francaise Theatre, a stone's throw from Newton MRT station. Little children were provided with small Ikea footstools to sit on atop the seats, to give them a better view, and sitting stability. The story centres around three main characters - Smallest Dragon, Leaf and Twiglet. Among the three, Twiglet had a fixed mindset that only certain things can be found in specific shapes and colour - for example, only the Moon is round, and only the Sky is blue. Her friends Smallest Dragon and Leaf helped her to overcome her fear of exploring new ideas and what the world has to offer. It was nice to see her overcome her fear. The performance included music and dancing, and parts where the children were teased into pointing out characters that were hiding. The children loved these bits and Bubbles joined in to shout and point out the characters "He is there! He is there!" while Bun chuckled and mimicked her sister. The children were also taught to "Look, See, Explore, Discover" - four actions that we remembered after the show ended. 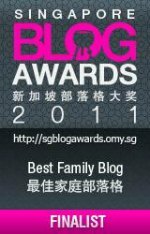 Towards the end of the story, two children were invited on stage to play with some large cut-outs of different shapes. They were asked to form different objects with the shapes. This was quite interesting and Smallest Dragon and Leaf played along as well, forming objects such as an ice-cream cone (a triangle and a circle), and a cat (a circle and two triangles). This production is based primarily on actions and sounds, with minimal actual conversations. The actors only spoke key words and phrases to make certain points, and would use vocal sounds and other gestures to tell the story. It was interesting to see how little words are needed for the story to unfold. However, on the flip-side, because of this, I feel that this production is probably more suitable for younger children, say 5 and below, as older children may prefer or expect actual words to be spoken or sung. Children were treated to a photography session with the characters after the show too - a nice keepsake especially as Bun's first brush with theatre. 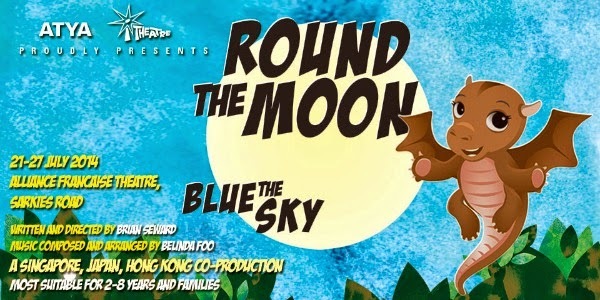 Round the Moon, Blue the Sky is running till 27 July 2014 and tickets are still available. Thank you I-Theatre for providing us with four tickets for the show! Ooh you noticed! I got it for $10 at the Salvation Army thrift store :) It has a cute back detail too, will try to get a pic of it to show! wah! that's such a good find!